If you’re looking for the perfect outdoor natural gas grill, then the Lynx L600PS-NG Sedona 36-Inch Built-in Natural Gas Grill with Pro Sear burner is an excellent choice. With over 800-square inches of cooking space available, you can easily cook up your favorite delectable meats and veggies in no time. The patented ignition system with battery backup makes sure your grill lights when you’re ready to cook. The grill offers a sturdy, durable design that will stand the test of time in your backyard kitchen set up. Design your own space with unique décor and add this built-in natural gas grill to complete the look. You can cook up your favorite party items, steaks on Friday night, or your favorite burgers and hot dogs over the weekend. 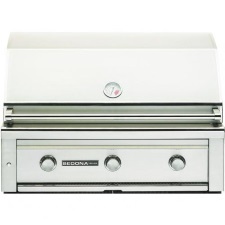 Many of the features of the Sedona grill make it easy to maintain the perfect control throughout the grilling process. The lighted controls use LED illumination to make sure you can see precisely where your burners are at during cooking. You can easily see what temperature setting you have the grill on even when it’s dark outside. Halogen lights on the inside of the grill make it simple to keep an eye on the meat and veggies you’re cooking no matter what time it is. If you’re cooking later in the evening or in full sun, you’ll be able to see what your grill is doing at all times. The temperature gauge on the grill also allows you to see just what the inside of the grill is doing without opening it up and losing heat. This will help you to keep an accurate read of what’s going on with your heat so that you can smoke items, cook your favorite chicken to perfection or simply grill up some sausages. The Sedona built-in grill offers a variety of options for cooking up your favorite dinner. You can easily sear your favorite cut of steak with the powerful Pro-Sear burner that is added. If you’re wanting to cook something a little slower, then the powerful burners can be put at the right temperature for all your favorite meats or vegetable items. You have a total of 69,000 BTU’s produced in this grill selection making it the perfect cooking companion for your outdoor kitchen. Prepare shrimp, shish-ka-bobs, steaks, and so much more with the ample cooking options that this new addition provides you. You can rest assured that when you’re using this grill model, you’re going to have delicious meals on your table at all times. When writing this review, there were only a few customer reviews on Amazon … at time of writing about 3 reviewers. While the number is small, the reviews were overwhelmingly in favor of the Sedona 36-Inch Built-in Natural Gas Grill. The customers who have purchased and reviewed this grill model gave it a resounding 5 out of 5 stars in their ratings. Overall there were no negative comments to be found. The positive remarks included things such as … “Love this grill!” … “Met all my expectations” … “Yes, I love it!” … “This is the center piece of our outdoor kitchen”. In conclusion of this review, the Sedona 36-Inch Built-in Natural Gas Grill is a perfect addition for those looking to create a breathtaking backyard kitchen. Whether you want to put it in a rock overlay or build up a totally different look, this will be the top-quality center piece for your entire kitchen area. You can grill, slow cook, and so much more with this amazing piece of quality equipment. Discover why so many others have rated this a five-star grill and why the Lynx brand is touted as one of the world’s best grills, hands down. Create your own backyard kitchen and see what exciting and new creations you can come up with when you add the Sedona 36-Inch Built-in Natural Gas Grill. Compare the grill for yourself and see why so many people just like you are touting the benefits and advantages to this particular model. You’ll be glad you did when you’re cooking up your favorite items in your beautiful, relaxing outdoor kitchen.